Poltava [Полтава]. Map: IV-15. A city (2013 pop 296,760) on the right bank of the Vorskla River and the administrative center of Poltava oblast. It is also a major industrial and communications center. History to 1914. The archeological evidence shows that the city site was inhabited as early as the 7th or 6th century BC. The city is first mentioned, as Ltava, in the Hypatian Chronicle under the year 1174. In 1240 it was captured by the Mongols, and from the second half of the 14th century it belonged to the Grand Duchy of Lithuania. After a long silence its name appears in a charter of Grand Duke Vytautas the Great in 1430. In 1569 Poltava became part of the Polish-Lithuanian Commonwealth. In the Hetman state set up by Bohdan Khmelnytsky it served as a regimental center (1648–1775; see Poltava regiment) and flourished as a trading town. It obtained the rights of Magdeburg law in the 17th century. The town suffered losses in 1658, when its colonel, Martyn Pushkar, rebelled against Hetman Ivan Vyhovsky, and in the 1690s, when it was attacked by the Crimean Tatars. During the Russian-Swedish War (1708–9) it withstood the two-month siege by Swedish and Ukrainian forces led by King Charles XII and Hetman Ivan Mazepa and witnessed the allies' defeat by Peter I on 8 July 1709 (see Battle of Poltava). With the abolition of the Hetman state Poltava became a county center of New Russia gubernia (1775–83), Katerynoslav vicegerency (1784–95), and Little Russia gubernia (1796–1802). Then, for over a century, it served as the administrative center of Poltava gubernia. 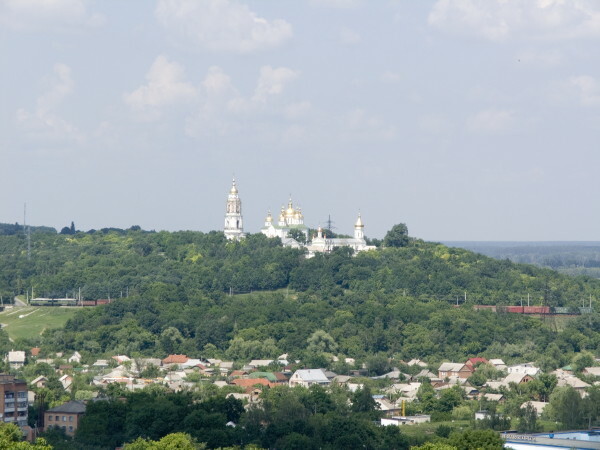 At the end of the 18th century Poltava covered a flat plateau that descended abruptly to the Vorskla River and was dissected by several ravines. In the southeastern corner of the plateau stood a fortress, the earthworks and moats of which encircled the administrative buildings, cathedral, and other churches. The Monastery of the Elevation of the Cross was built in 1650 by Martyn Pushkar outside the town walls. In 1798–9 Poltava's population reached 7,200. In the 19th century Poltava, as the gubernia capital (of Poltava gubernia) and the seat of the governor-general of Little Russia, was completely rebuilt according to a general plan approved by the imperial government in Saint Petersburg on 10 February 1803. The old fortifications were leveled, and the new town was designed around Kruhla Square, a circular plaza 345 m in diameter. Eight streets radiated at equal angles from the square to the other districts. At the center of the square the Column of Glory was erected in 1811 to commemorate the Russian victory over the Swedish-Ukrainian allies. 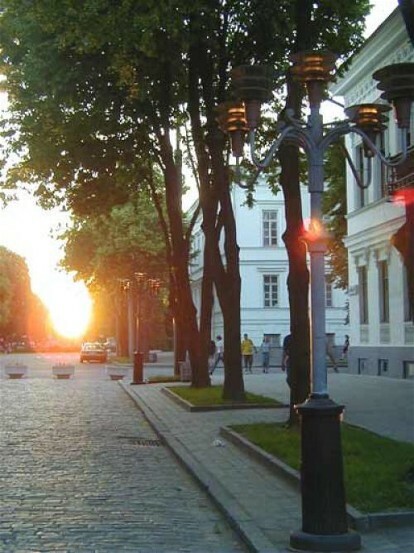 The main avenue of the town was Oleksandrivska Street (later Zhovtneva). In the 1830s the central square was planted with trees and converted into a park. 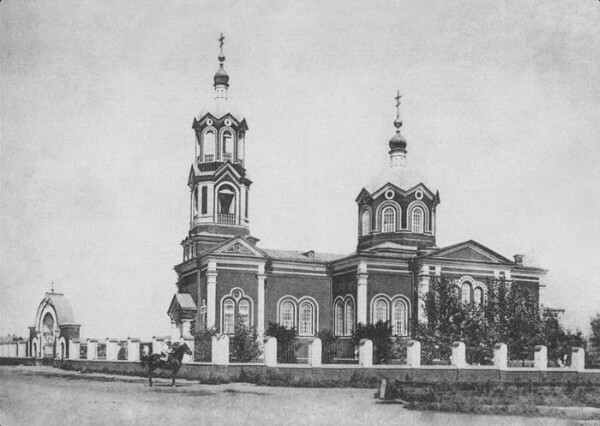 The establishment of Poltava eparchy in 1803 contributed to the town's importance, although the bishop's seat was not transferred from Pereiaslav to Poltava until 1847. Prince A. Kurakin, the governor-general of Little Russia, fostered the town's growth. A woolen-cloth industry (see Textile industry) was established in the town by German families, who settled there in 1808. In 1852 the Saint Elijah Fair, one of the largest wool and horse fairs in Ukraine, was transferred to Poltava from Romny. In 1863 alone, 16.9 million rubles' worth of goods was sold at the fair. New railways built in the 1870s and 1890s provided a stimulus to the town's economy. Toward the end of the 19th century, however, competition from Kharkiv undercut Poltava's economic position. It became a provincial administrative-commercial town with manufacturing limited mostly to cottage industry. The more important branches were food industry (brewing, dairy industry, flour milling, and tobacco industry) and light industry (hosiery-making). The larger enterprises employed only about 2,000 people. The population grew quite rapidly, from 8,000 in 1802 to 15,500 in 1858, 29,500 in 1863, 53,700 in 1897, and 60,100 in 1902. 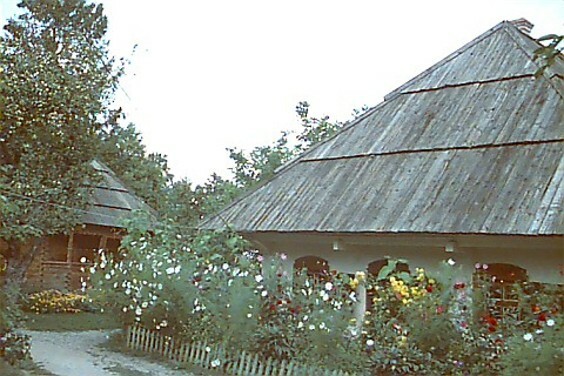 Despite its population growth and physical expansion, at the beginning of the 20th century Poltava was still a semirural town. In 1882 scarcely 9.4 percent of the buildings were stone, and in 1910 barely 8 percent of the roads were hard surface. 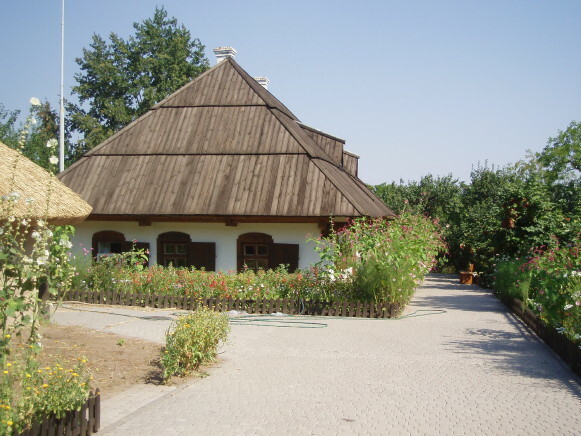 The houses in the low-lying suburbs, mostly Cossack homesteads, were completely rural in character. 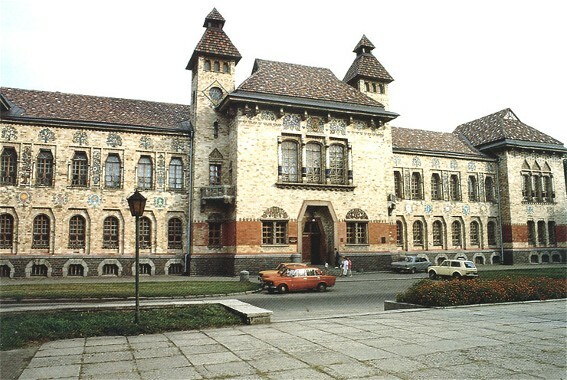 At the end of the 19th and the beginning of the 20th century, a number of graceful, mostly public, buildings, such as the Poltava Zemstvo Building (1903–7), designed by Vasyl H. Krychevsky, were constructed. Cultural and political life. 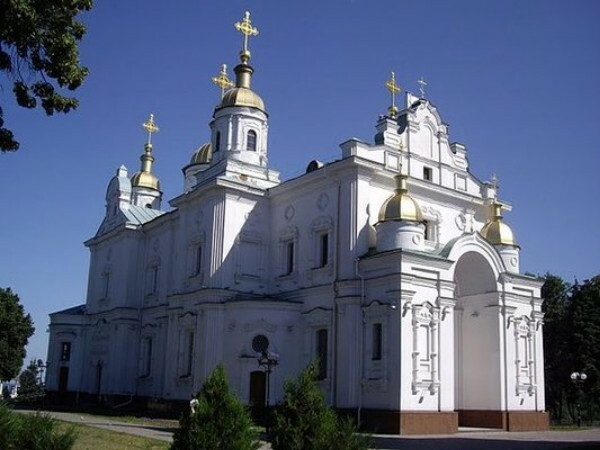 In the last quarter of the 18th century Poltava began to develop into an important cultural center. The sons of some regimental officers (Paskevych, Hnidych, and others) studied at German universities. In the 1770s P. Paskevych, a fellow of the standard, opened a bookstore and sold Russian and other foreign publications. 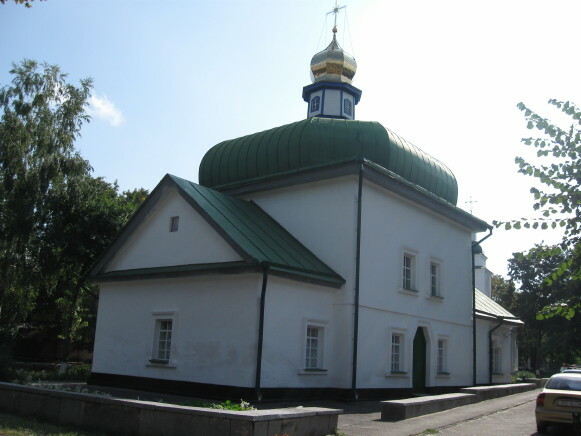 The Poltava Slavonic Seminary (1770–80) contributed to the town's cultural life. In the first quarter of the 19th century Poltava continued to develop, and its culture became increasingly Ukrainian. The Ukrainian autonomists, including Vasyl Kapnist and Vasyl Lukashevych, were active in the local Masonic lodge, which called itself Love of Truth, and in the Little Russian Secret Society. Dmytro Bantysh-Kamensky wrote his Istoriia Maloi Rossii (A History of Little Russia, 1822) in Poltava. In the 1840s the local members of the Cyril and Methodius Brotherhood, such as Vasyl Bilozersky, Yurii Andruzky, and Dmytro Pylchykov, spread its ideas in the region. In 1861 a hromada of about 60 members, including Pylchykov, Oleksander Konysky, Viktor Loboda, Vasyl Kulyk, Mykhailo Zhuchenko, and Yelysaveta Myloradovych, arose in Poltava. It conducted educational and cultural work until the authorities launched their reactionary policies against Ukrainian culture in 1863 (see Valuev circular). In the 19th century Poltava was an important educational center: a gymnasium was opened (1805), the Poltava Institute for Daughters of the Nobility and a clerical school (1818), a cadet school (1840), and a theological seminary (1797–1819 and 1862–1917). Many Ukrainian cultural figures graduated from the town's schools: Mykhailo Drahomanov, Mykhailo Ostrohradsky, Leonid Hlibov, and Mykhailo Starytsky were graduates of its gymnasium, and Vasyl Hohol-Yanovsky, Osyp Bodiansky, Levko Borovykovsky, and Symon Petliura attended its seminary. 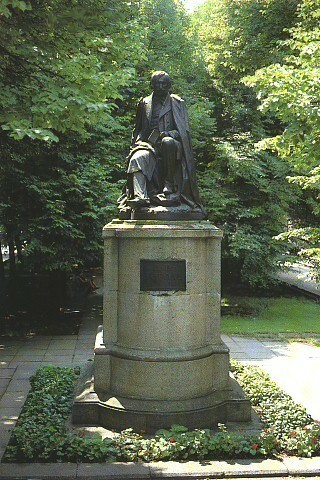 Nikolai Gogol studied at the Poltava county school in 1818–19. Later in the century, the Poltava Gubernia Zemstvo played a leading cultural and scientific role: it published over 110 scholarly volumes on the Poltava region, including a collection of materials for assessing the land in the gubernia, a collection of economic statistics, and a series of yearbooks. 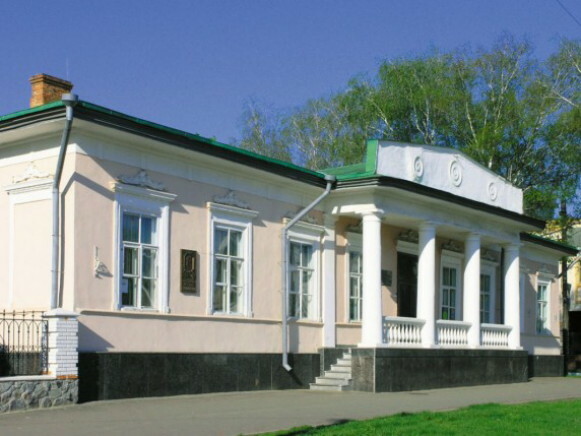 In 1891 the zemstvo administration established a museum (now Poltava Regional Studies Museum). From 1903 the Poltava Gubernia Learned Archival Commission took the lead in organizing research on the Poltava region. 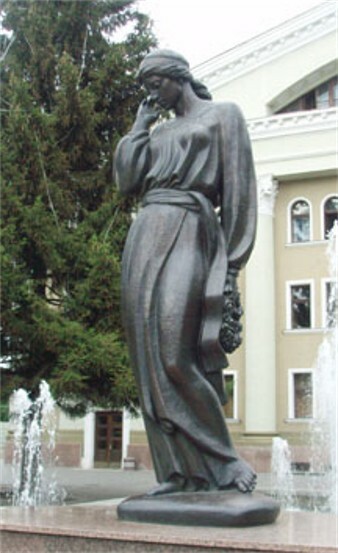 Poltava played a prominent role in the Ukrainian literary renaissance of the 19th century. The writers Ivan Kotliarevsky, Levko Borovykovsky, Mykhailo Starytsky (1850s), Oleksander Konysky, and Panas Myrny (1871–1920) and the Russian writer of Ukrainian origin Vladimir Korolenko (1903–21) lived and worked in Poltava. In 1838 the weekly Poltavskie vedomosti and in 1863 Poltavskie eparkhialnye vedomosti began to appear there. After the Revolution of 1905 the Ukrainian weekly Ridnyi krai was published by Hryhorii Markevych, who established himself as a publisher in Poltava. Poltava has a long theatrical tradition. One of the first theaters in Ukraine was built there in 1808. Ivan Kotliarevsky wrote his plays there and staged them at the Poltava Free Theater in 1818–21. The first professional performances of his plays were done in Poltava by O. Kalynovsky and J. Stein's touring theater company and involved the actors Mikhail Shchepkin and Kateryna Nalotova. Then Karpo Solenyk performed in Poltava with Stein's and Liudvig Mlotkovsky's companies. The famous troups of Marko Kropyvnytsky, Mykola Sadovsky, and Panas Saksahansky, with stars such as Mariia Zankovetska, Hanna Zatyrkevych-Karpynska, Ivan Tobilevych, and Mariia Sadovska-Barilotti, visited Poltava. 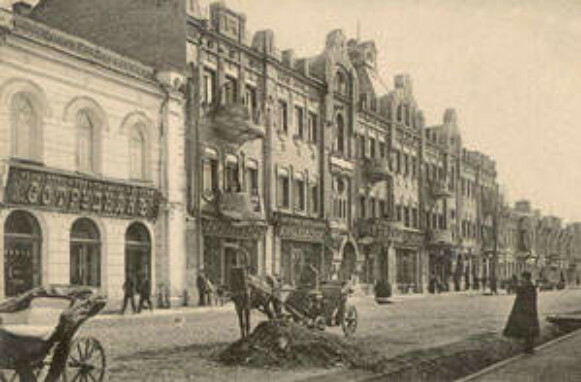 In 1906 Sadovsky organized a company and prepared a repertoire in Poltava for his first permanent theater, which he set up in Kyiv in 1907 (see Sadovsky's Theater). 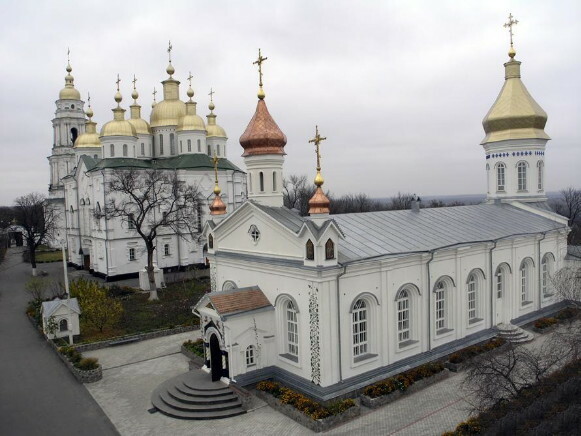 In the early 19th century, concerts in Poltava were performed by serf orchestras and choirs. The composers Aloiz Jedlička (from 1848) and Petro Shchurovsky (early 1870s) worked there. 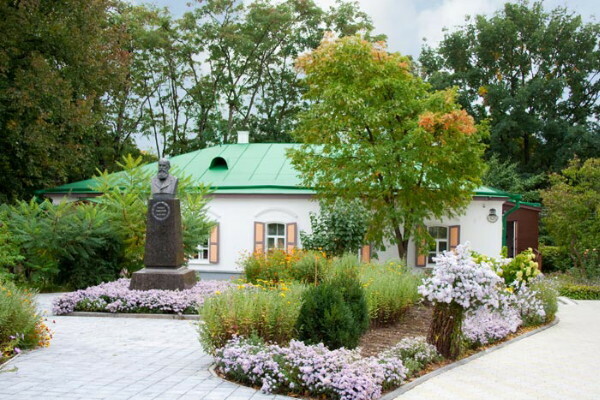 In the 19th century the sculptor Leonid Pozen and at the beginning of the 20th century the painters Mykola Yaroshenko, Serhii Vasylkivsky, Vasyl H. Krychevsky, Porfyrii Martynovych, and Mykhailo Havrylko lived and worked in Poltava. By the early 20th century the Ukrainian movement was well entrenched in Poltava. 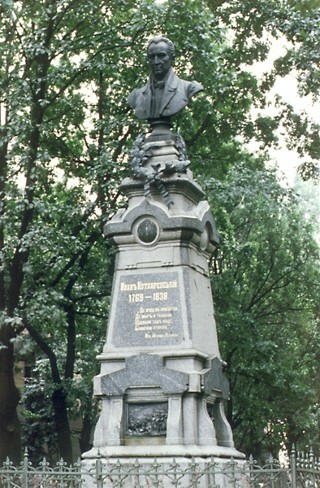 The dedication of the Ivan Kotliarevsky monument on 30 August 1903 drew to Poltava representatives of the national movement from all parts of Ukraine. In 1906 the Prosvita society was set up. In 1900 a circle of the Revolutionary Ukrainian party was formed in Poltava. Later the Society of Ukrainian Progressives was active there. History after 1914. 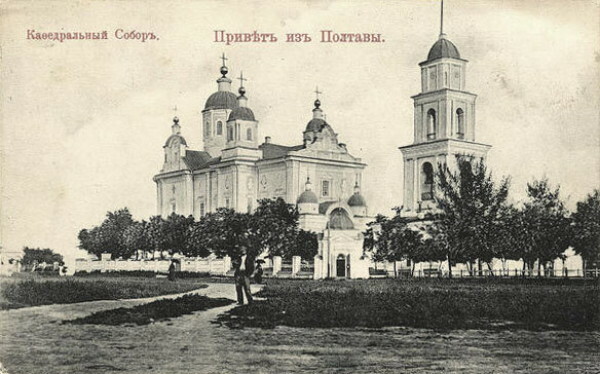 During the period of Ukraine’s struggle for independence (1917–21) Poltava was an important locus of Ukrainian political and cultural activity. In May 1917 the Society of Ukrainian Progressives organized a conference of 600 delegates from the Poltava region. Andrii Livytsky was appointed the gubernia commissioner of the Ukrainian National Republic, and Viktor Andriievsky, education commissioner. Vistnyk Poltavs’koho huberniial’noho komitetu was published in Ukrainian and Russian. Under the Soviet regime Poltava became an okruha (1925–30), a county (1930–7), and finally an oblast center. During the Second World War it suffered extensive destruction, particularly in 1943, but it was rebuilt in the late 1940s and early 1950s. In 1957 a plan of development for the city was worked out. The city is built up more densely than before: it covers an area of 8,341 ha, of which 2,543 ha are open space and 5,100 are built up. New building ensembles have appeared near Teatralna and Pryvokzalna squares. New residential districts have been developed in the northwest near the Kyiv–Kharkiv highway, in the northeast near the Poltava battlefield, and in the valley along the Vorskla River. The city was divided into three administrative raions. Poltava's population grew from 60,100 in 1912 to 92,600 in 1926, 128,500 in 1939, 143,100 in 1953, and 220,000 in 1970. 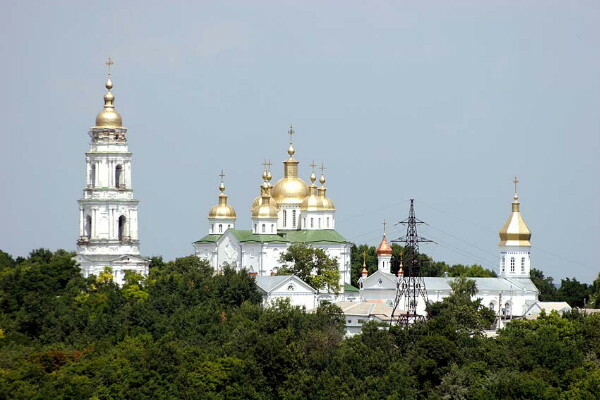 Of the larger cities in Ukraine Poltava has the highest percentage of Ukrainians. In 1926, 68.3 percent of its residents were Ukrainian, 20.1 percent were Jewish, and 8.9 percent were Russian. In 1959, 80 percent were Ukrainian, 15 percent were Russian, and 3 percent were Jewish. The population growth can be attributed largely to the change in the structure of Poltava's economy: since the end of the 1920s, industrial development has been emphasized. Today 34.8 percent of the city's jobs are in industry, 11.1 percent are in transportation, and 8.3 percent are in construction. There are over 50 large industrial enterprises in Poltava. The largest branch is the food industry, which accounts for 40 percent of the industrial output. It includes an oil-, lard-, and meat-processing complex, a poultry packing complex, flour mills, and a confectionery factory. Light industry, which includes a cotton-spinning plant, a sewing factory, a knitwear and glove factory, an embroidery factory, and a leather footwear factory, accounts for about 20 percent of the industrial output. About 25 percent of the output is produced by the machine building and metalworking industry, which include a locomotive repair yard, machine building for chemical industry, a turbine plant, an electrical machinery factory, an engine foundry, and a meat and dairy machinery plant. The chemical industry produces glass and plastics. The building-materials industry and the printing industry are also important in the local economy. Education and culture. The Ukrainian Learned Society for the Study and Preservation of Historical and Artistic Monuments of the Poltava Region was founded in 1919. It managed to publish the first volume of its proceedings. 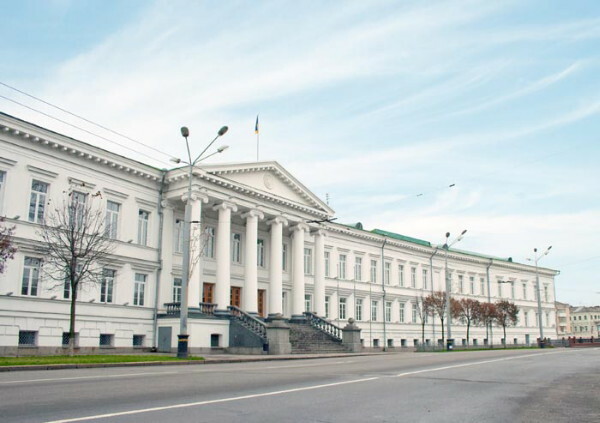 In the 1920s it was reorganized into the Poltava Scientific Society of the All-Ukrainian Academy of Sciences; its membership included Natalia Mirza-Avakiants, Vadym Shcherbakivsky, Dmytro Solovei, Mykhailo Rudynsky, Volodymyr Shchepotiev, Pavlo Klepatsky, and M. Buzhynsky. 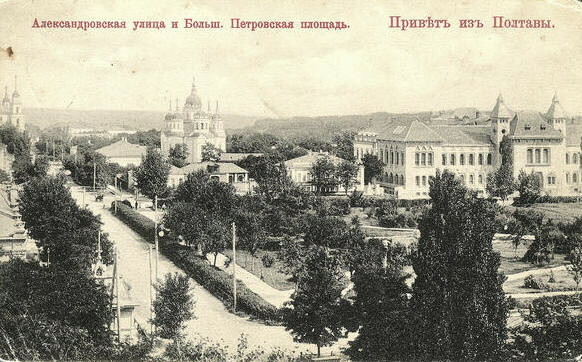 Owing to the efforts of the Prosvita society and the support of Dmytro Bahalii, Mykola Sumtsov, and other faculty members of Kharkiv University, the historical-philological faculty was set up in 1918. 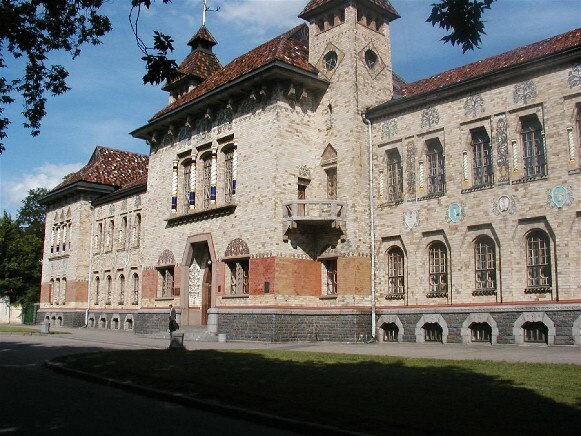 In 1920 it was merged with the Pedagogical Institute (the former Teachers' Institute) to form the Poltava Institute of People's Education, which in 1934 was turned into the Poltava Pedagogical Institute. The Soviet pedagogue Anton Makarenko worked in Poltava in 1914–20. 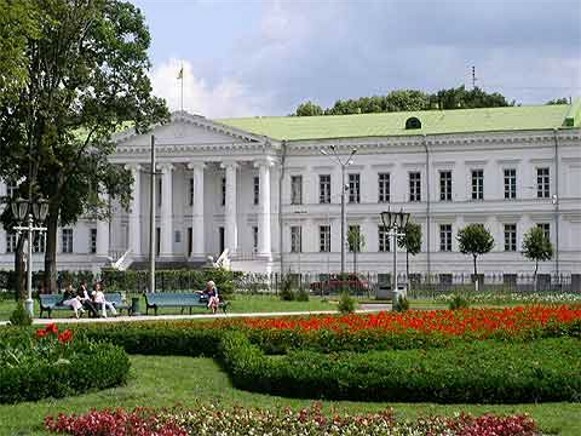 Today Poltava has six state-run higher educational institutions, including the Poltava National Pedagogical University, Poltava National technical University, Poltava State Agricultural Academy, Poltava University of Economy and Trade, and Poltava Medical Stomatological Academy. There are more than 10 special secondary schools and 9 vocational schools. The chief research institutes are the Poltava Gravimetric Observatory, the Poltava Agricultural Research Station, and the Poltava Scientific Research Institute of Hog Raising. 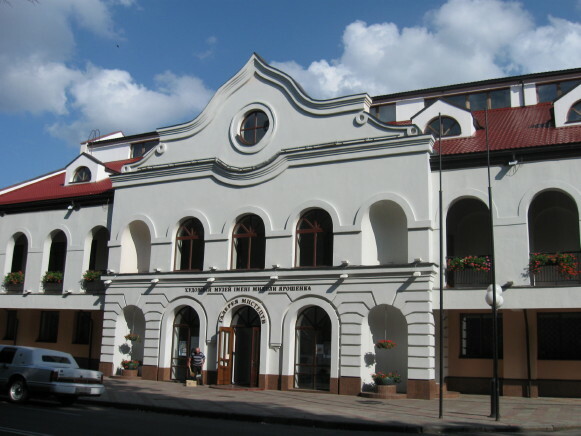 The city supports two theaters (the Poltava Ukrainian Music and Drama Theater and the puppet theater), a philharmonic orchestra, and six music schools. It has more than 10 major museums, including the Poltava Regional Studies Museum, the Poltava Art Museum, the Museum of the Battle of Poltava, and the Ivan Kotliarevsky, Vladimir Korolenko, and Panas Myrny literary memorial museums. Architecture. A small proportion of the city's historical monuments have been preserved. Only the baroque cathedral (1689–1709) and its four-tier bell tower (1786, restored in 1954–5) remain of the Monastery of the Elevation of the Cross. 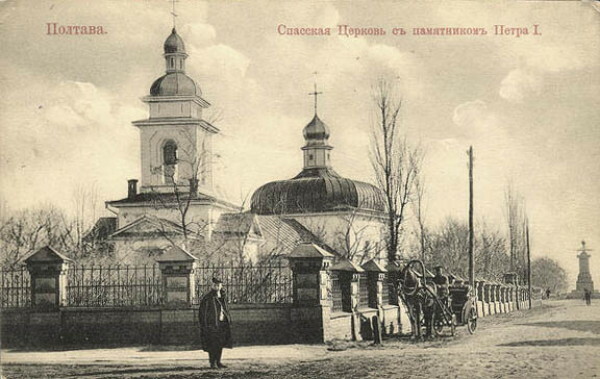 Of the churches that were once within the town fortifications, only the wooden Transfiguration Church (1705–9), in a stone encasing, and the bell tower (1801) of the destroyed town cathedral (1748–70) survive. The building ensemble on Kruhla Square designed by A. Zakharov in 1805–11 is a fine example of classicism. It includes the residences of the governor-general, governor (now the building of the oblast trade unions), and vice-governor, the gubernia office building (now the building of the Poltava oblast executive committee), the nobles' assembly building (now the Kotliarevsky Cinema), designed by M. Onyshchenko, and the municipal hospital, built by M. Amvrosimov. 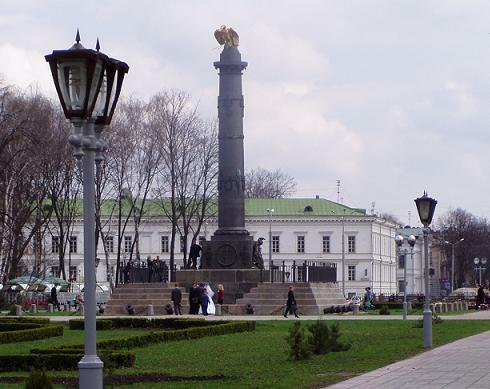 The Column of Glory at the center of the square was built by T. de Tomon and sculpted by F. Shchedrin. All those buildings were heavily damaged in 1943 and restored in 1950. 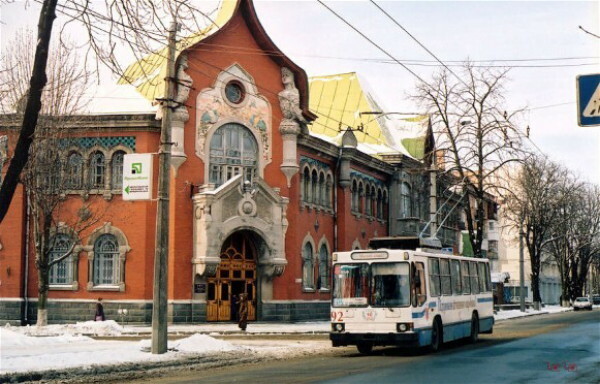 The building of the Poltava Gubernia Zemstvo (now of the Poltava Regional Studies Museum), designed by Vasyl H. Krychevsky in 1903–7, painted by Serhii Vasylkivsky, and ornamented by P. Yukhymenko, embodies the traditional forms of Ukrainian folk architecture. Modern ensembles have been built on Pryvokzalna, Teatralna, and Soborna squares. One of the better examples of contemporary styles is the Poltava Ukrainian Music and Drama Theater (1952–7), designed by O. Malyshenko and O. Kralova. The more important monuments in Poltava are those to Ivan Kotliarevsky (1903, by Leonid Pozen), Nikolai Gogol (1915, by Pozen), Panas Myrny (1951, by Makar Vronsky and Oleksii Oliinyk), and Taras Shevchenko (1926, by Ivan Kavaleridze). 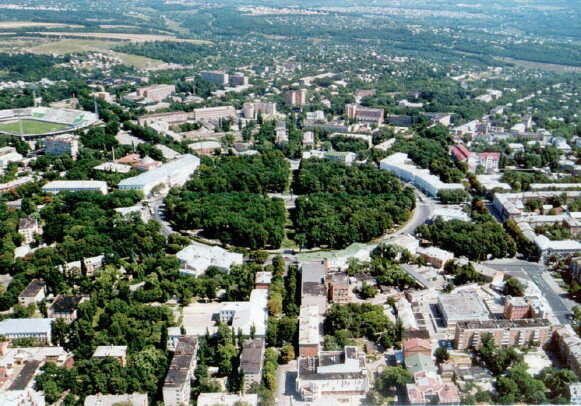 Poltava is one of the greenest cities in Ukraine. Its largest park is Petrovsky. Since 1960 the city has been supplied with natural gas. Its public transportation (see Urban transit) system uses buses and streetcars. A referral to this page is found in 204 entries.